The Coastal National Elevation Database (CoNED) Project - topobathymetric digital elevation models (TBDEMs) are merged renderings of both topography (land elevation) and bathymetry (water depth) to provide seamless elevation products for select coastal regions in the United States (2011-present). 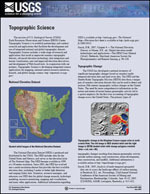 Physical processes in the coastal environments are controlled by the geomorphology of both “over-the-land” topography and “underwater” bathymetry; therefore, many applications of geospatial data in coastal environments require detailed knowledge of near-shore topography and bathymetry (topobathymetry). The Coastal National Elevation Database (CoNED) Project is a collaboration between the U.S. Geological Survey (USGS) Coastal and Marine Geology Program (CMGP), the National Geospatial Program (NGP), and the National Oceanic and Atmospheric Administration (NOAA) National Geophysical Data Center (NGDC). This coastal elevation database integrates disparate light detection and ranging (lidar) and bathymetric data sources into common databases aligned both vertically and horizontally to common reference systems. CoNED Project - topobathymetric digital elevation models (TBDEMs) provide a required seamless elevation product for science application studies such as shoreline delineation, coastal inundation mapping, sediment-transport, sea-level rise, storm surge models, tsunami impact assessment, and analysis of the impact of various climate change scenarios on coastal regions. CoNED Project elevation model development is focused in select regions along the U.S. coast, such as in the Northern Gulf of Mexico (NGOM), the Hurricane Sandy region, San Francisco Bay, the Pacific Northwest, and the North Slope of Alaska. The models vary in spatial resolution from 1 to 3 meters. The temporal range of the input bathymetry and topography data varies for most CoNED Project TBDEMs from the mid- to late-1900s to the present. The raster topobathymetric elevation product, the Federal Geographic Data Committee (FGDC) metadata, and a spatial referenced ESRI shapefile are contained in the downloadable bundle. This collection of high-resolution coastal elevation data is available in a user-friendly Georeferenced Tagged Image File Format (GeoTIFF). The elevation model has floating point numeric values. Areas where data is incomplete due to lack of full image coverage or No Data are represented with the numeric value of -3.40282346639e+038. CoNED topobathymetric elevation data are intended for scientific use within a Geographic Information System (GIS) or other special application software. *Projection and resolution will vary by region. Coverage Maps indicating the availability of CoNED TBDEM products are available for download. EarthExplorer can be used to search, preview, and download CoNED topobathymetric digital elevation models. The collection is located under the Digital Elevation category. The coverage map in EarthExplorer indicates the availability of data for coastal regions in this collection. Project level downloads are available through the CoNED Project Viewer. Hurricane Sandy science plan: coastal impact assessments; 2013; FS; 2013-3090; Stronko, Jakob M.
The Coastal National Elevation Database (CoNED) Project Viewer is a portal to the topobathymetric models created with the expertise of the expertise of the U.S. Geological Survey Earth Resources Observation and Science (EROS) Center near Sioux Falls, SD.